A boys' club in Bristol has changed its name after the council threatened to withdraw funding if the club did not show girls were also welcome. 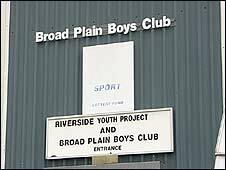 Broad Plain Boys' Club - now the Broad Plain Working with Young People Group - was formed 115 years ago in 1894. The club receives £11,600 from Bristol City Council and said they had now had to recruit two part-time female club leaders, meaning more expense. A council spokesman said: "It's all about being inclusive." The club's leader, Dennis Stinchcombe, 53, said: "It's this PC bureaucracy gone mad - it has obviously touched someone's nerve. "But they're saying that it's got to be completely and openly mixed. "If they're in a position of power, they're able to do this today. And if it means that we could lose the little bit of funding that we do get, then of course we have to fight our corner and hope that we can manage to save that little bit. "The boys' club - formerly the lads' club - has always been a major service, primarily for boys of course." The spokesman for Bristol City Council continued: "The criteria is that if you want funding, you have to show that you are meeting the needs of all young people, not a specific group of people. "The name change was agreed some time ago." Mr Stinchcombe said that they started accepting young women two nights per week about eight years ago and that the council have said that they will help the club to build on that. He said that the club would continue to keep to their boys only policy three nights per week on Monday, Wednesday and Friday.